Home Our Garage Door Services Garage Door Maintenance How Safe Is Your Garage Door? All modern garage door openers are fitted with a few safety features that are essential to keep you and your family safe at home. However, very few homeowners know how to test these systems to make sure they’re still working correctly. We think it’s vital to regularly check your door’s safety features, and in this guide we’ll show you how to do so. Firstly, we need to talk about why your door has several safety features to start with. It’s not that the system is dangerous in itself, but it’s easy to forget what it really is; a 150lb or more door that's being moved by a very powerful motor a tension-based spring mechanism. It’s not something you want to get trapped under, or to be accidentally injured by when some part of it breaks. As long as the system is properly looked after, you won’t have to worry. There are 2 main mechanisms that help prevent accidents with your garage door opener; firstly, you have the safety sensors. 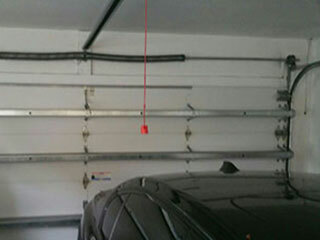 These usually consist of a pair of plastic sensors installed on either side of the garage's opening (usually attached to the lower ends of the tracks). These sensors emit an infrared beam between them, and if this beam is interrupted at any point they’ll send a message to the opener's operating system to not let the door close, i.e. reverse its operation. This means if your child walks under the door while it’s closing it should automatically stop and reverse. Bear in mind, though, that you can still be in the door’s way and not trigger the sensors, especially if the sensors are misaligned. To test these photo eyes you need to place a block of wood in the door’s path, and check that the door behaves as expected when you try to close it. If it keeps closing normally, the sensors need to be checked and potentially realigned or replaced. So what happens if the door actually closes on something? The opener motor is strong enough to lift a heavy metal door, and it’ll happily keep running until the door closes fully. To prevent dangerous accidents, all openers manufactured since 1993 have been designed with an auto-reverse function. If the door meets significant resistance then it will immediately reverse its direction - this means it won’t keep trying to press on something that’s blocking its the way. To test this function, place a chair in the door’s path (but don't let it interrupt the safety sensors’ beam). When the door meets the chair, it should stop and reverse. If it fails to do so, our technicians will need to adjust the settings of your opener and possible repair some parts.